Cairns, QLD. 13th July 2015. I mentioned before that I hadn’t seen much of Cairns, and it was Wednesday before I was able to do anything about that. Since arriving on Monday I had had a frustrating time. Last time I was there I had ordered a couple of items off the internet, to be delivered to the hostel. They’re quite happy to accept letters or parcels providing you have a reservation there. One package had arrived but the second, and more important one, hadn’t. To make matters more difficult the wi-fi at the hostel was playing up, and had been since the previous Thursday. The staff at the hostel could do nothing about it as it was managed off site somewhere. Unusually, it seemed we were all in it together. A nice picture to make me feel better. So it was Tuesday before I could start to chase my second package, which contained a fuel bladder. This handy item is rather like a hot water bottle in that it will store flat or even rolled up when empty but can be used as needed to carry extra fuel. The problem was that I couldn’t get hold of the company to find out where it was. I was due to leave the hostel on Thursday and I needed to know. Their phone went to an answering machine and their website was down. It wasn’t looking good. I finally got to talk to someone and was promised a call back, which never came. Then the hostel wi-fi crashed again. $%@+#*&! 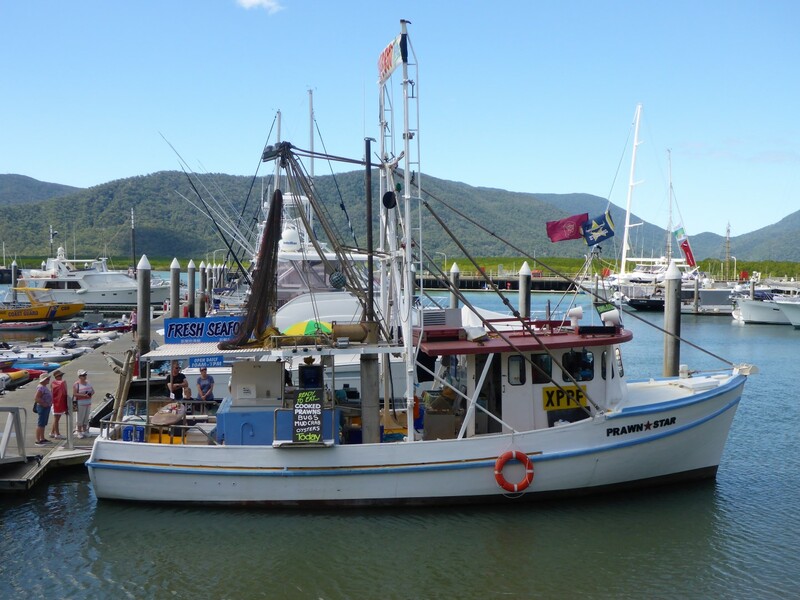 Fresh seafood off the boat, at Cairns Marina. On Wednesday I had to make a decision: wait for it to arrive, if indeed it had been sent, or leave without it. The option I took was to find a different supplier on the internet and order another one, on express delivery, hoping it would arrive on Thursday. Friday was a bank holiday. The bladder I ordered wasn’t exactly what I wanted, it was too big really, but I needed something in anticipation of long distances with few servos. I was very pleased when the hostel staff told me, Thursday morning, that my package had arrived. When I looked at the contents it was the original fuel bladder! It had been sent after all. Now I was going to have two. The second one didn’t arrive on Thursday anyway so I rang the company and they agreed they’d refund me when the bladder arrived back with them. The hostel staff said they’d be happy to send it back to them (for a small fee) so I was now free to leave with everything looking good. What a palaver. Had I been too impatient or too cautious? I wasn’t sure. These items are only available on-line so I had to act while I had an address to get things sent to. 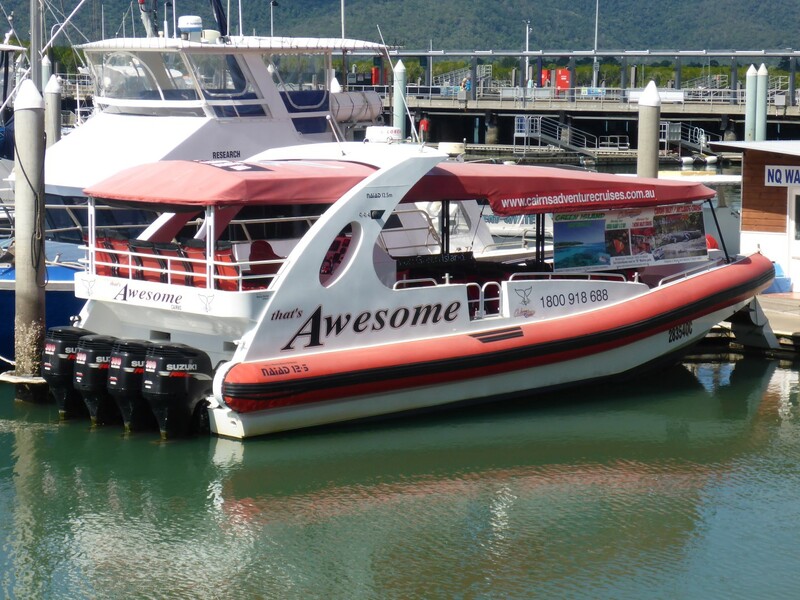 Four 300BHP outboard engines strikes me as being pretty awesome too. On the Wednesday I finally got out and about in the town and took a walk along the promenade and out to the marina. I took advantage of a ‘Coffee and Toasty, $7’ offer – far too good to pass by – and then enjoyed admiring the ‘rich boys toys’ moored up in expensive rows. The town had taken great efforts to make the waterfront an interesting place. 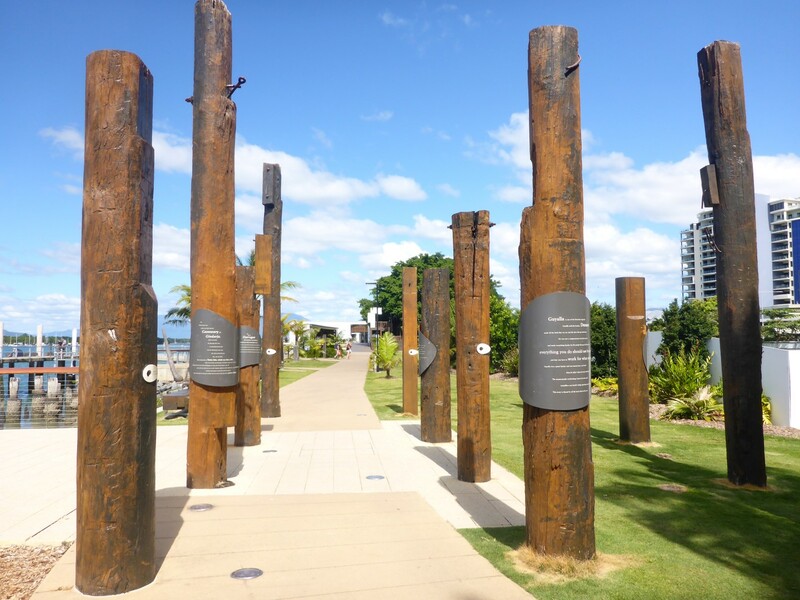 There were several sites presenting Aboriginal stories and legends; a great sculpture reflecting another of their tales; some very interesting info boards describing the history of the harbour. Born out of of the need to transport mining and farm products, it slowly changed from wooden jetties with different owners to a town run business with modern wharfs and warehouses. Growing pains included labour disputes, as workers flexed their newly collectivised muscles in the early 20th century fight against deadly and unfair work practices, and the meeting the needs of WW2 shipping in the fight against Japan. Many of the themes are shared with other ports along Australia’s north east coast. A very interesting walk. Some Aboriginal ‘Dreamtime’ stories, well presented on indgenous wood. 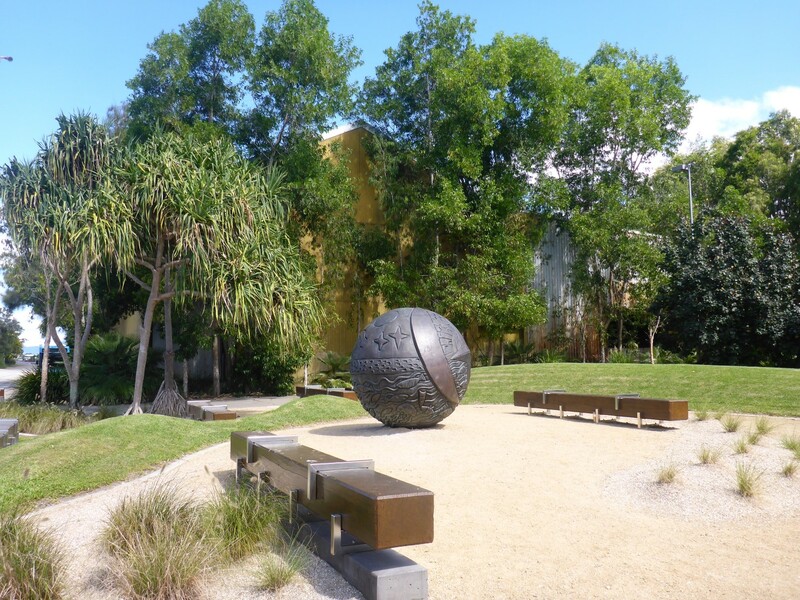 Nice sculpture with an Aboriginal theme. 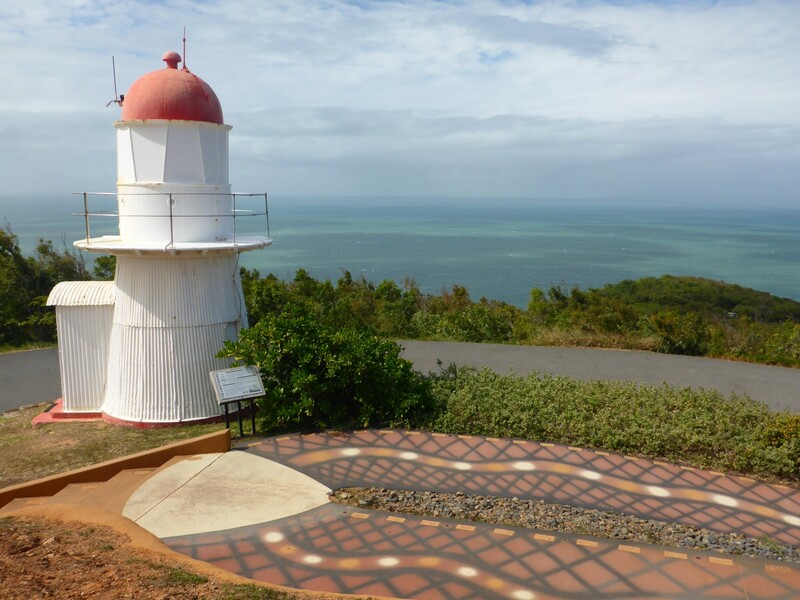 I left Cairns on Friday morning, having stayed an extra night, and headed up the coast towards Daintree. I diverted into Port Douglas, a nice tourist town. There wasn’t much there to detain me but there was a nice view point up on the hill so I went up there and admired the view over the bay. Next port of call was Mossman, where I went out to visit Mossman Gorge. This is another of nature’s presents to us all and had interesting walks in the bush and along the Mossman River. But of greater interest to me was the Aboriginal centre along the gorge. When I got to the visitor centre I just scraped in on the 13.30 tour – an advantage of being alone – The Dreamtime Gorge Walk. 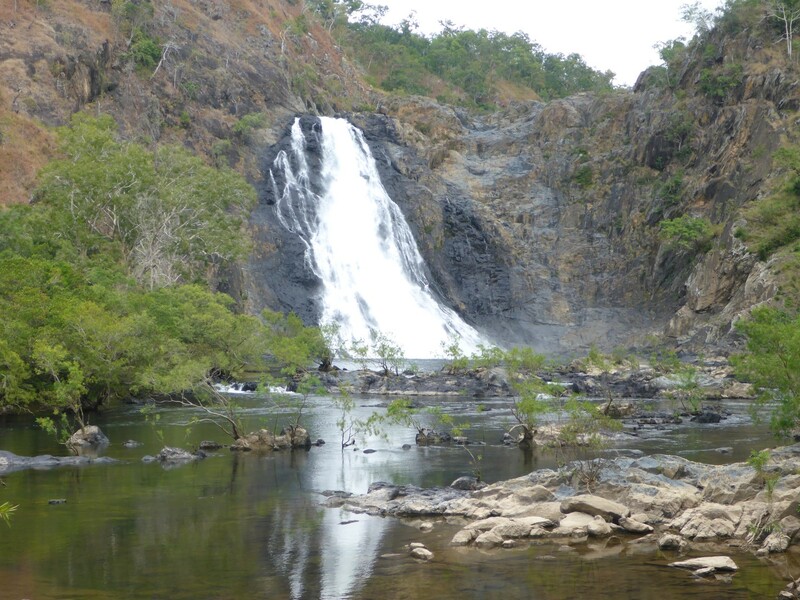 The part of the gorge we went to can only be visited with a guide and some of the cost of the tour goes to support the local Aboriginal community. Sean tells us all. Behind him is a Red Cedar tree and bones would have been placed inside the hollow trunk. We were taken to the start by coach and Sean, our guide, told us something of the history of the centre. The excellent visitor centre had only been open three years, having been moved from further up the gorge. When we got to the start point of our walk we were treated to a traditional smoking ceremony. We were invited to walk around a smoking fire, to connect us to the ancestors and to welcome us to the land. 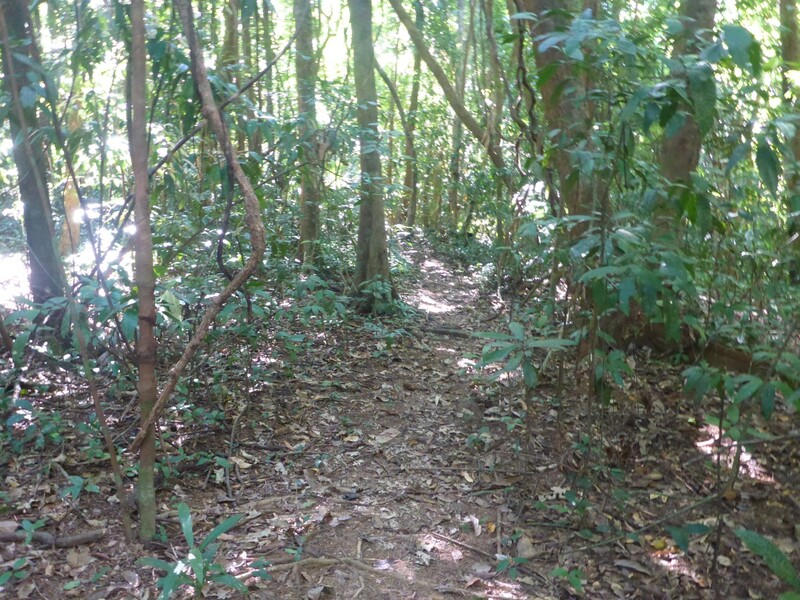 Our walking destination was Rex Creek, a tributary of the Mossman River. Sean told us that it has the second purest water in the world flowing down it. I had to ask the obvious questions; what makes it so pure and where is the most pure water to be found? It seems that this water falls as rain in Papua New Guinea, leaches down through the limestone rocks there and finds its way into aquifers which spread beneath the sea between the two countries. It then rises as a spring, forming Rex Creek. Amazing! Large parts of Australia’s water comes from similar underground reserves. And the purest water in the world? That can be found in British Columbia, as one of the Canadians in the group was happy to confirm. Mixing up the paint for body decoration. The youngest member of the group gets persuaded to be decorated. Sean explained many things to us about Aboriginal history and how they lived; how important the land was; social groupings; marriage etc. He also told us about the rainforest in which we walked. So here’s a rundown. The rainforest has been around for about 140 million years. By comparison, the Amazonian rainforest is 7 million years old. It’s the remnants of what used to cover Gondwanaland. Of the nineteen unique plant species in the world, thirteen of them can be found here. In fact a fern, only recently rediscovered, had previously only been seen as a fossil. One plant has a fruit that produces cyanide, which was used to stun fish by throwing it in the water. There is a plant called the Lawyer Plant because of the barbs on it. A modern name obviously. When it was much smaller this sapling was bent and tied to form this direction post. It points the way. 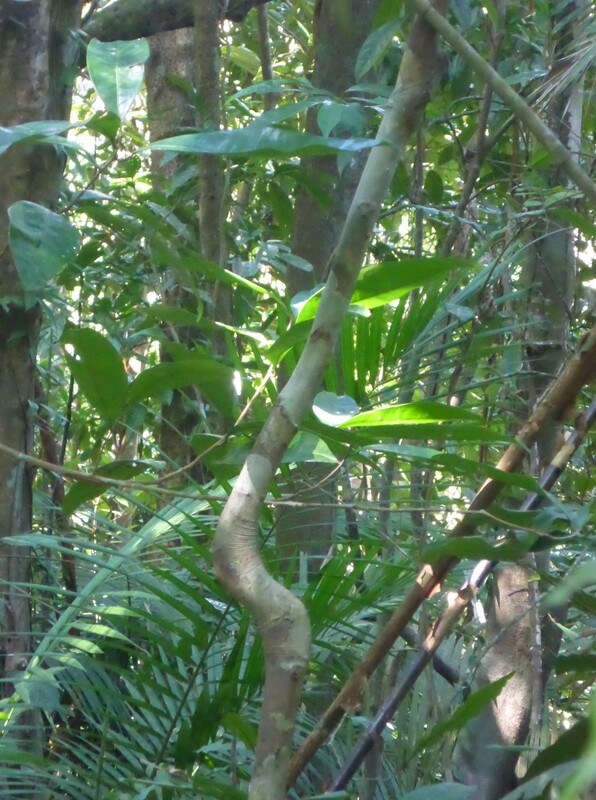 The Aboriginals have many uses for many different plants, in common with most forest dwellers. They would move up into the hills in the summer, to escape the heat and find food, then move back in the winter. Other than that they would tend to live in the same places. Aboriginals have occupied the land for over forty thousand years. Different racial groups evolved over time across Australia but the anthropology is similar all over. North Australians have been trading with people from Asia for over seven thousand years and were introduced to the Iron Age by them. There was some intermarrying too. There are many different languages and that tends to define the social groupings. Within the language groups there are clans. Men and women live separately but come together often for social events and to discuss clan affairs. Men can have several wives and women several husbands. In this way children will have many parents, aunts, uncles, grandparents etc. Both boys and girls go through initiation ceremonies and around the age of nine or ten the boys are sent off to live with another clan. Within a language group each clan will have particular responsibilities for certain ceremonies. The boys have to learn these and will then o to live with different language groups. By the time they return, in their mid-twenties, they will be able to speak about twenty different languages. This is one reason why, apart from personal or trade disputes, Aboriginals rarely fight each other. Male quarters for this area. Not very salubrious! It took the incoming Europeans about one hundred and fifty years to almost completely destroy this culture and it is only in the last fifteen years or so that Aboriginals have been allowed back onto some of their traditional lands and to revitalise their traditional ceremonies. The ceremonies are all about the relationship with the land, ancestors and nature in general. They were a deep rooted part of the culture, which is why they were so important. In this area the first points of conflict between Aboriginals and Europeans centred around logging. Once the gold in the area ran out then Red Gold, Red Cedar trees, were what Europeans went for. This activity really tore into the heart of the local culture because it affected everything the Aboriginals relied on for life. No wonder conflict grew. They used to bury the bones of their dead in the base of cedar trees and the loggers took these knowing they had a value to collectors. Today Aboriginals are trying to get them back from the various museums and universities. These paths have been used for thousands of years. The tour finished with tea and damper (scone) and I must say it was easily one of the most interesting couple of hours I’ve spent in some time. 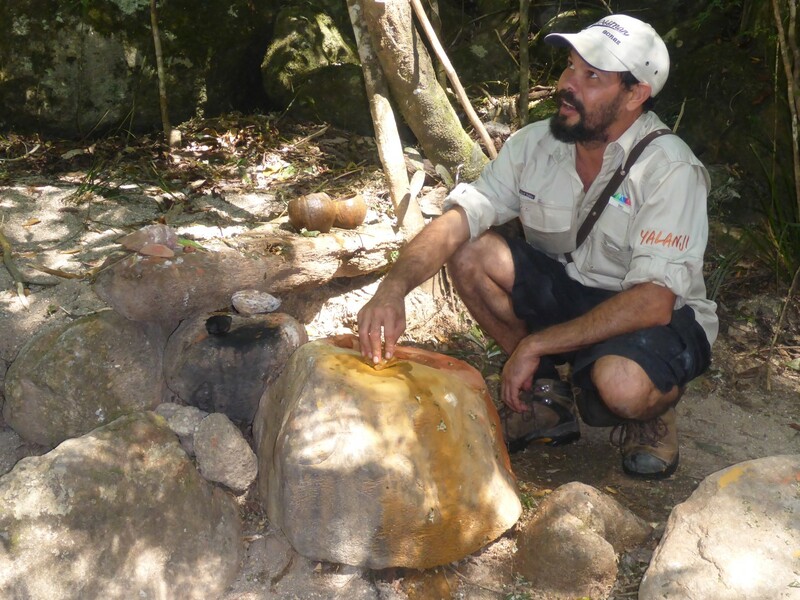 I was pleased to have learnt so much, delivered by Sean in a non-judgemental way, about Australia’s more ancient past. 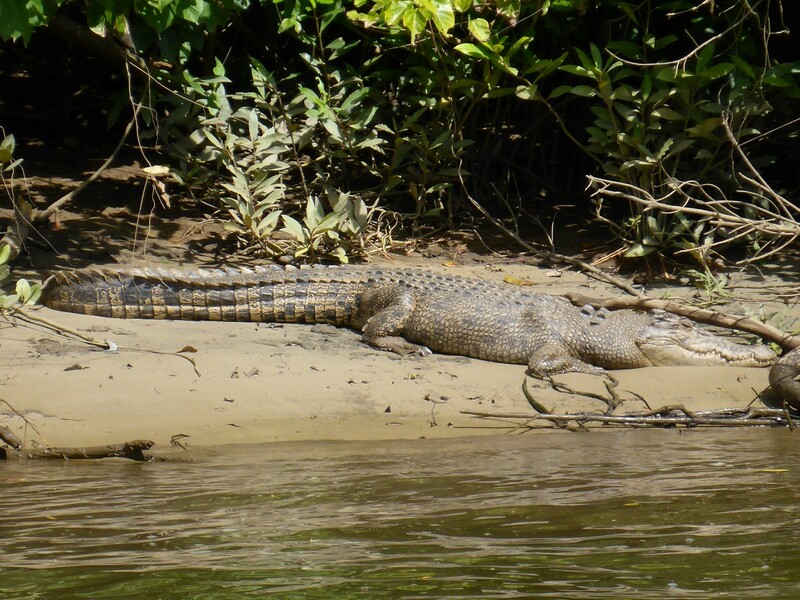 It was only a 35kms ride to the village of Daintree, on the Daintree River – Croc country! 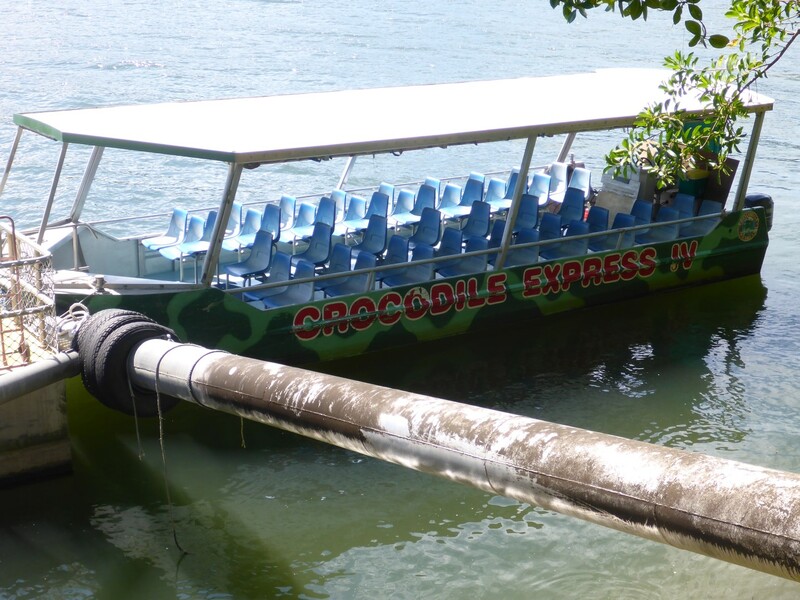 The campsite I was at also accepted bookings for the river trips run by Crocodile Express. $28 for the trip, with a second one thrown in for free. Or, to put it another way, we can’t be bothered to collect the money twice! One left from the jetty by the campsite, the other from the jetty by the ferry. So I got onto the 09.45 trip and began to learn about another of Australia’s ancient inhabitants. Crocs are now protected in Australia so are able to thrive. We took a slow cruise upstream, on the lookout for whatever wildlife there was to see. There were a couple of pelicans about; some very pretty, blues Ulysses Butterflies; a tree snake, almost impossible to see in its camouflage colours. Eventually we saw a croc, lying on the bank but half submerged. They will go in the water to keep cool or on the bank to get warm, depending on the time of day. So here’s some croccy facts. There’s two types, estuarine and fresh water. The freshies are small and almost never attack a human. Their teeth would do some damage but they’re not killers. The salties, on the other hand, are big. Males can be eight metres long and females six, but are more likely to be six and four metres. They can live up to two hundred years, more likely to be one hundred and fifty. About one hundred is average. They are survivors from the Dinosaur age and their survival skills are phenomenal. Their heart rate is forty beats per minute but they can stay under water for up to six hours by reducing that to two beats per minute. They will eat fish or mammals, what ever comes along. If they get a good meal, such as from eating an adult wild pig, they may not eat again for up to a year. Under normal circumstances they don’t see adult humans as prey but they are territorial and can sometimes be seriously hungry. The trick is to avoid needing to have the discussion in the first place! 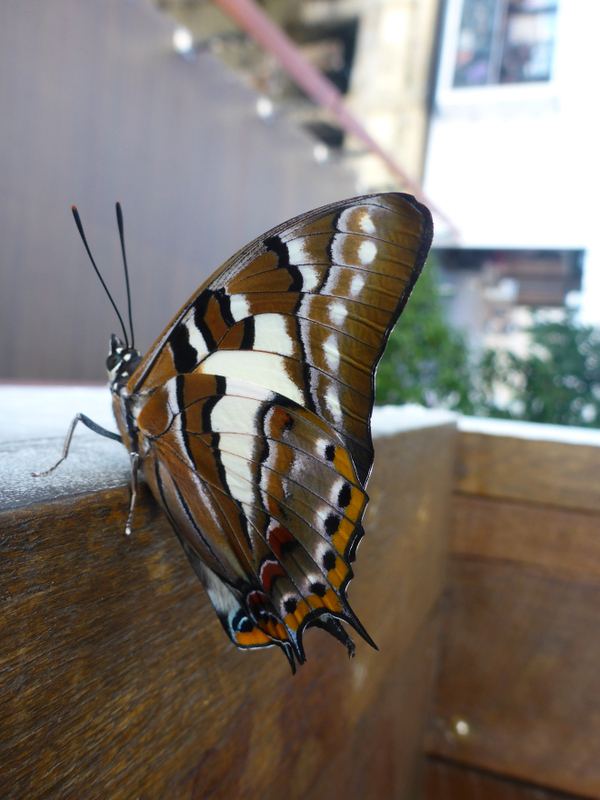 The scales on their back act like solar panels and absorb energy from the sun. Crocs are the least cruel of killing animals. Their pray will die very quickly from the bite and/or by drowning. It seems they get a bit of a bad press in being accused of cruelty. Although they generally prefer the salty, estuarine waters, they can be found a long way inland, maybe 120kms, as they search for food. Than can move overland if they need to and sometimes get stranded upstream in a creek or waterhole after the wet. Big, old and ugly. But that’s how things are in Croc land. Females build nests then lay around thirty eggs, only one of which will reach adulthood. If the eggs don’t get eaten then the hatchlings may get killed by a sibling – all crocs come out of their eggs with jaws already snapping – or eaten by a hungry male. If the eggs incubate at exactly 32 degrees they will all be males. Above or below that temperature, they will all be females. It tends to balance out. That was a great boat trip and when I got down to the ferry, the second one was even better. We saw a big, old male on the riverbank. 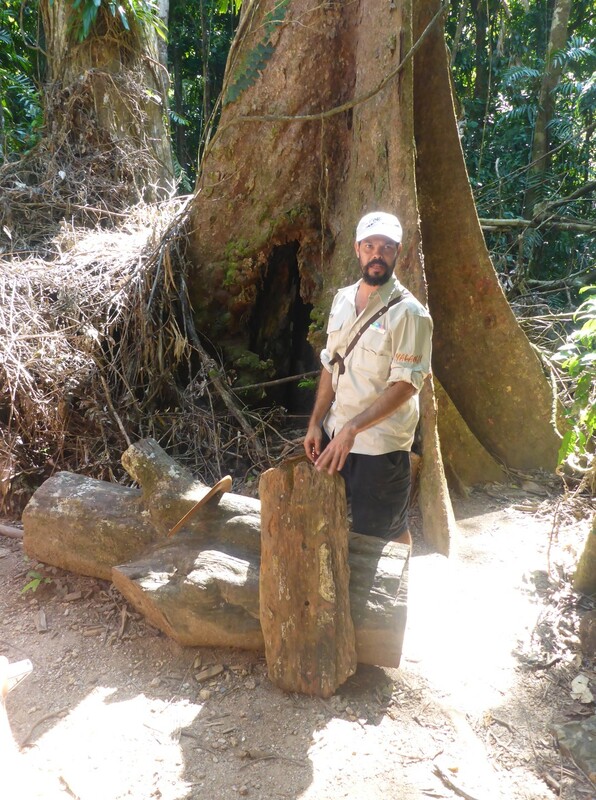 About six metres long and ninety years old, our guide reckoned. We also saw two females, one of them swimming around looking for a place to rest up on the riverbank. There were plenty of interesting birds around too. 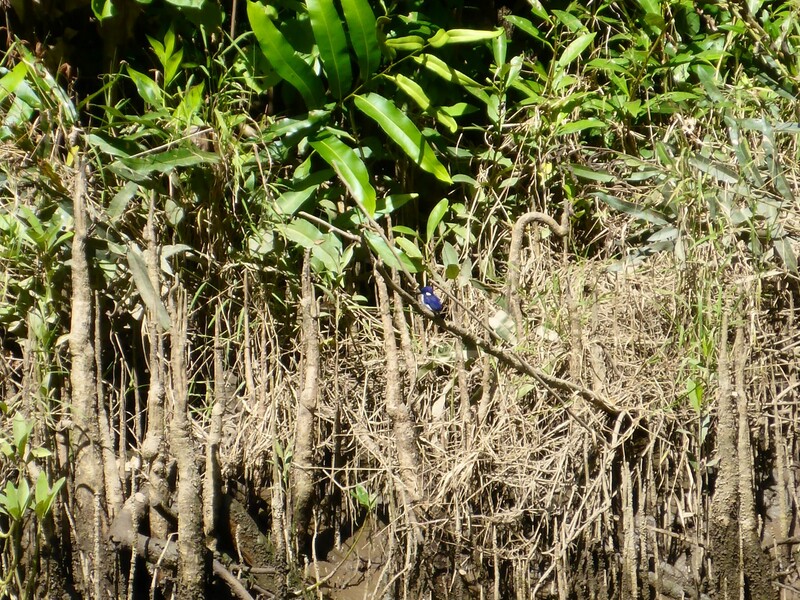 Sea eagles flying overhead; a small, yellow nectar eating bird was flitting around collecting spider’s web with which to build its nest; a beautiful, bright blue kingfisher, only two inches long and fishing busily. 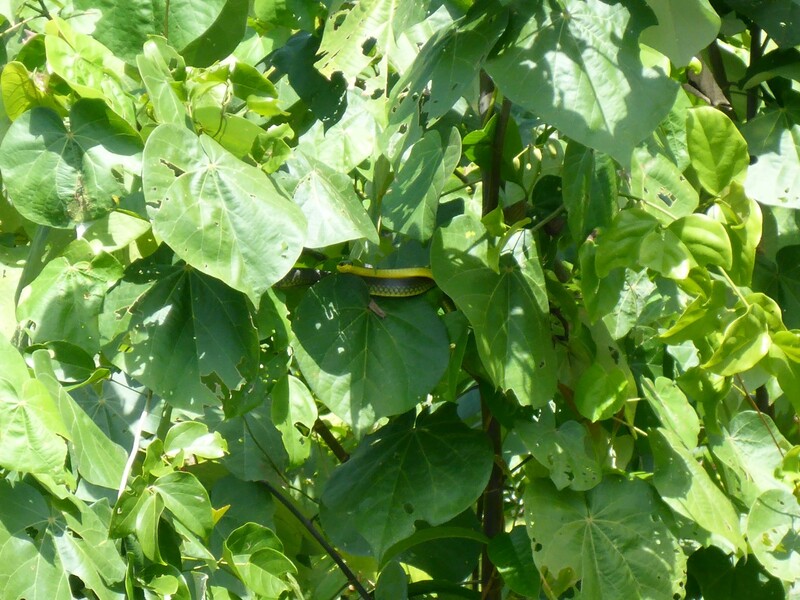 Finally, another tree snake and this time we could see its amazing yellow-green markings, perfect for hiding in the foliage. Superb value for money really, given how much we saw. Croc proof, we were assured. I queue jumped onto the ferry, crossed the Daintree River and carried on up the coast towards Cape Tribulation. On the way I stopped at Marrdja Boardwalk, a visitor attraction just by the coast. 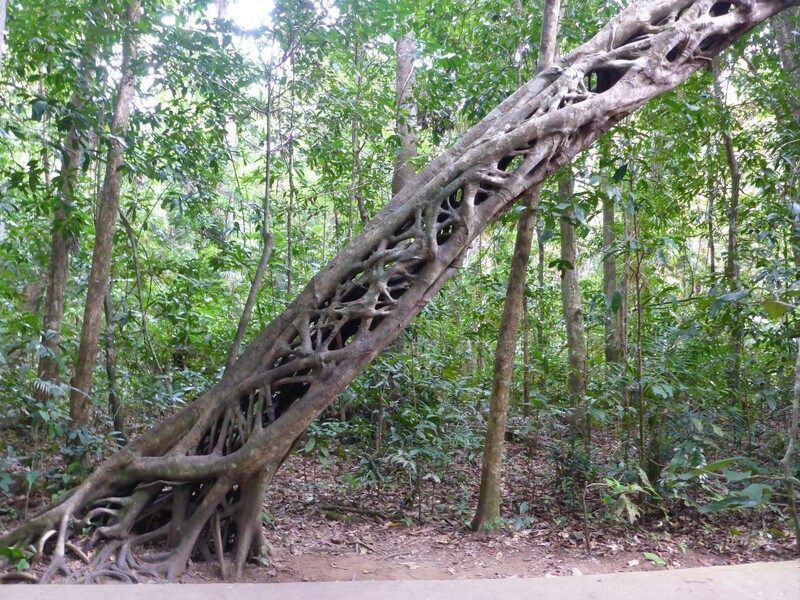 From the road the boardwalk goes into tropical rainforest, then crosses a creek where it enters mangrove forest. The two ecosystems sit side by side, separated by the creek, and they couldn’t be more different. Strangler figs, very tall fern trees, baskets of life etc. Many of which I’d seen before in other places. 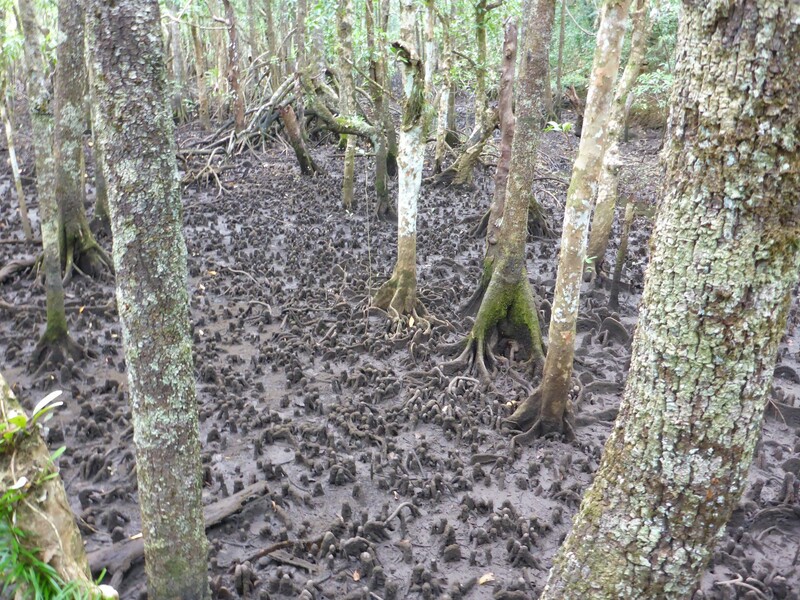 In the mangrove area, mangrove trees, with their weird root systems. They have a real struggle to survive in the salt water and use special techniques to help them. For example they store the salt they absorb in dying leaves which, when they fall off, take the salt with them. Some of the roots are like hollow pencils which stick up above the water and draw in oxygen. Fascinating stuff. 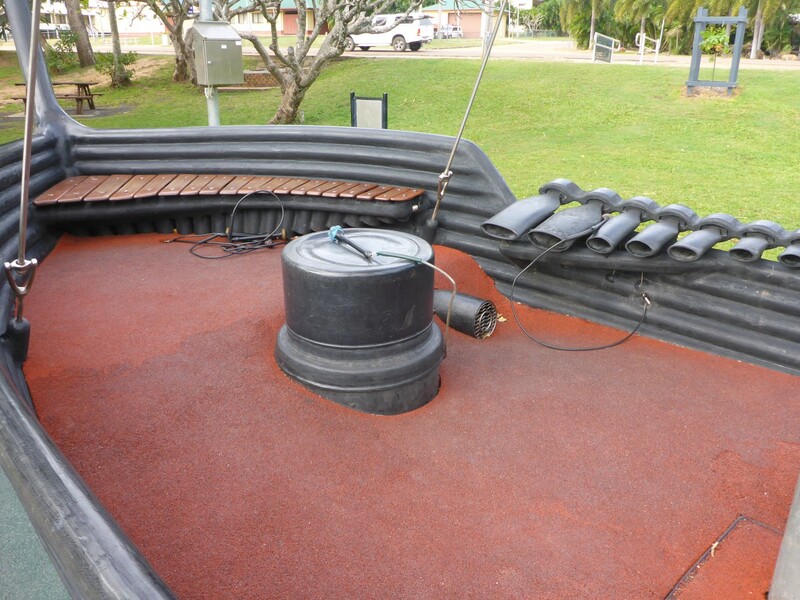 Once at Cape Tribulation, where the bitumen surface ended, I found a holiday centre which also had dorm beds. I was very glad of that as I was developing a very sore throat and fancied a bit of comfort. That included finding a local pub which served a very nice beef lasagne. I figured I was worth it! The Bloomfield Track, with a Fourby toughing it out. The Bloomfield Track took me out of Cape Tribulation up towards Cook Town. 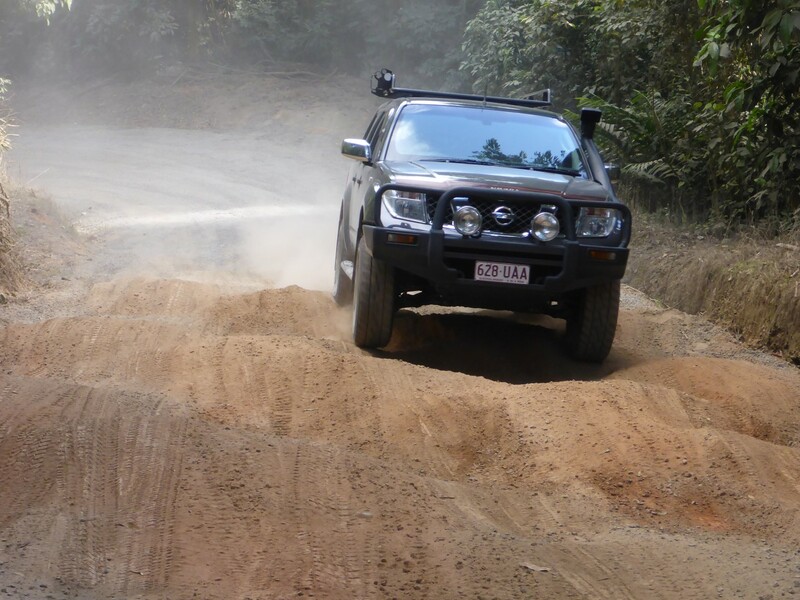 It’s 4WD only, just what I like to ride. It was rough and challenging in places, with a couple of creek crossings thrown in, but was only 30kms long and was fun while it lasted. It being a Sunday, the road was busy with weekenders, some of whom were driving a bit ‘on the edge’, too much so at times, I thought. A common sign when entering Aboriginal areas. 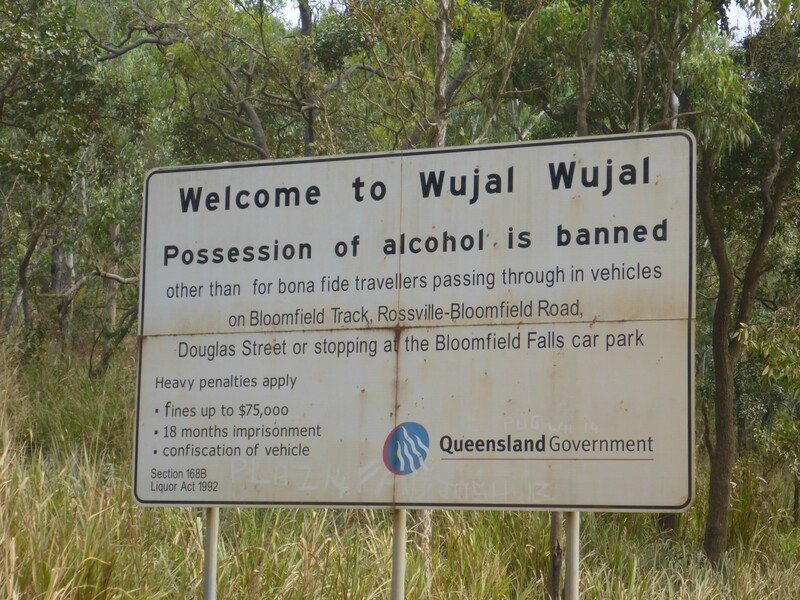 Once back on bitumen I came to the Aboriginal town of Wujal Wujal. Nearby was the very nice Bloomfield Falls, well worth the short diversion. Quite high, very pretty. It’s very difficult not to like a waterfall. I met a French couple there so, once again, I had a practice and got a compliment. 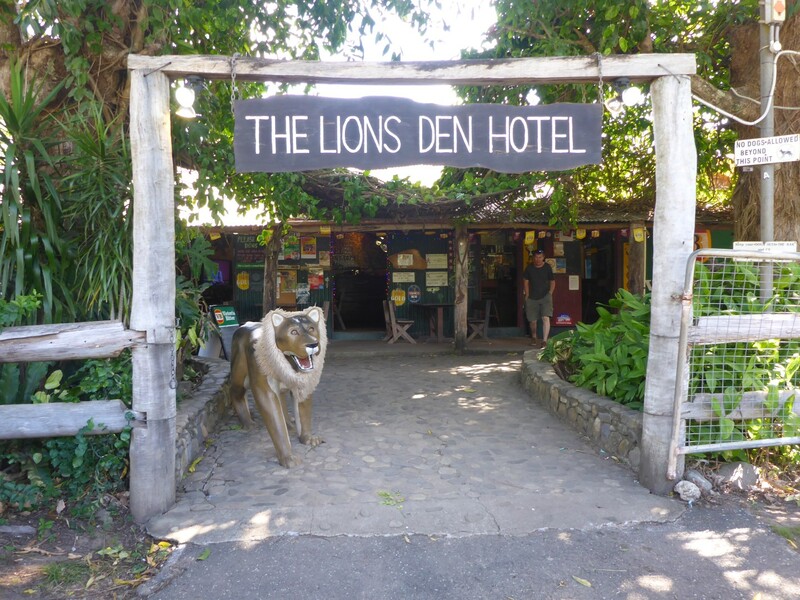 On the way to Cooktown is a very famous pub called The Lions Den. These days it has a camp site and it’s all about tourists, but it used to be a place for miners and stockmen to spend their money. 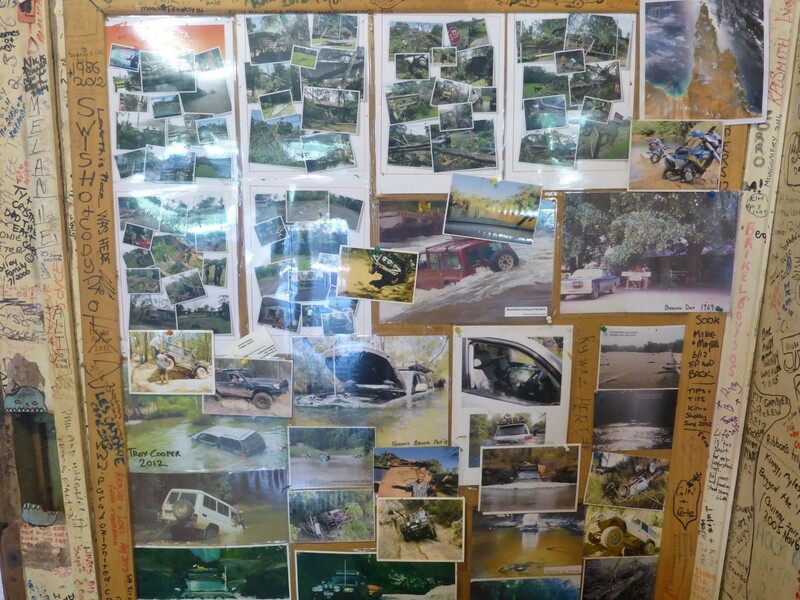 The walls are covered in memorabilia from travellers, such as number plates, photos of half drowned 4x4s and scribbled mottoes and messages. While I was walking around I was approached by a couple, Richard and Bev, who had seen my bike. They both ride Suzuki DR650’s and travel all over Australia on them. We had a good chat and as they live down on the Gold Coast I hope to be able to call in and see them later in my journey. Lions Den pub – outside. One more roadside stop, at a viewing point for the Black Mountain. 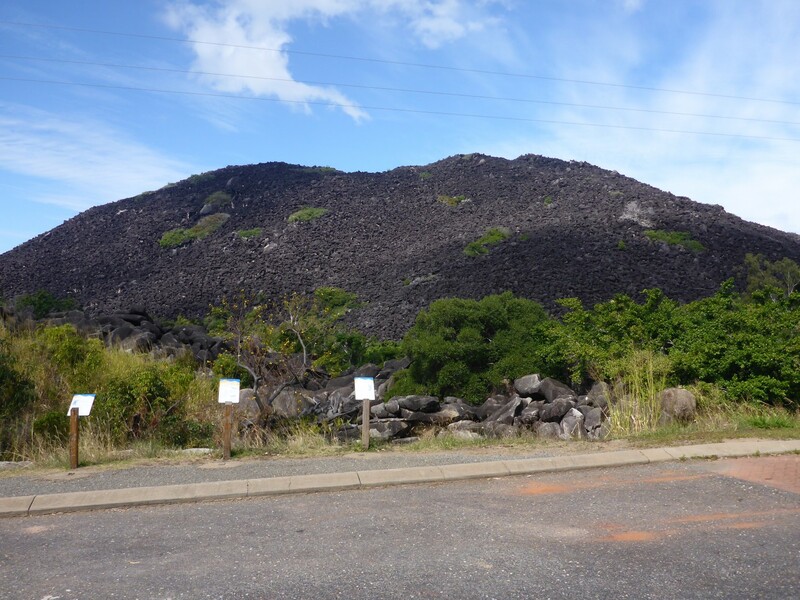 This is a 260 million year old granite rock formation, born of volcanic eruptions beneath the ground. The covering rock has weathered away leaving a high hill of peculiarly shaped rocks and boulders. There are some fauna there unique to the area and it is a special place for the local Aboriginals. 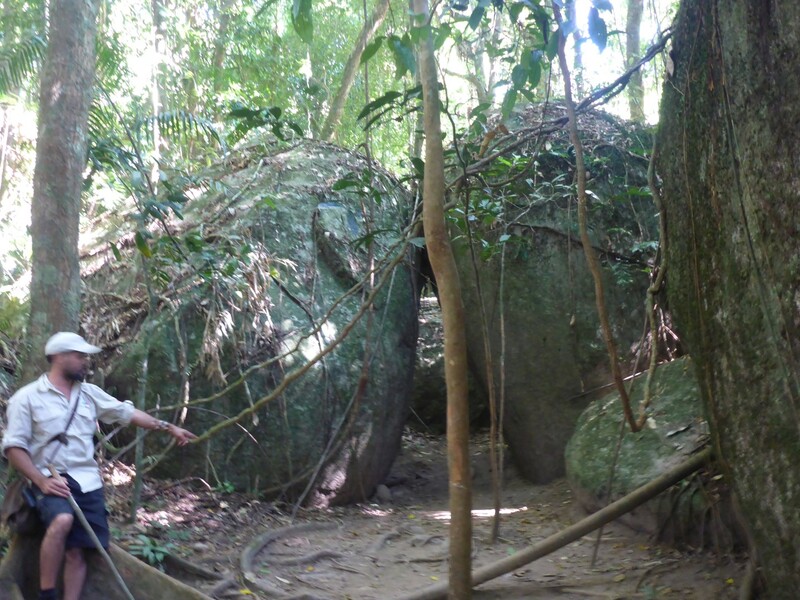 It also marks the northern perimeter of the tropical rain forest. It wasn’t long to Cooktown now and once there I discovered that the one and only backpacker lodge was full. Plenty of room at the campsite though. There were very strong gusts of wind blowing across the site and getting the tent up was a struggle, with one of the poles smacking me across the head at one point. But perseverance won through and once I’d got some shopping, with some all important cough medicine, I had an early night. 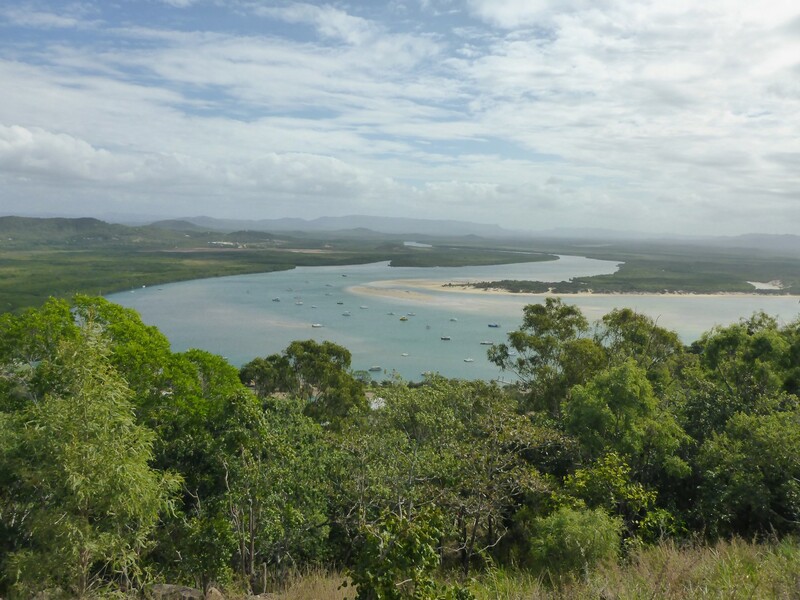 Cooktown didn’t exist until the Palmer River gold rush. But it was known to have a good harbour and good access to inland areas. How was this known? Because it was the first place in Australia where James Cook came ashore. He hadn’t planned to but an argument between the Great barrier Reef and the hull of his ship forced his hand. He spent forty eight days there, undertaking repairs on his ship and exploring the local area. 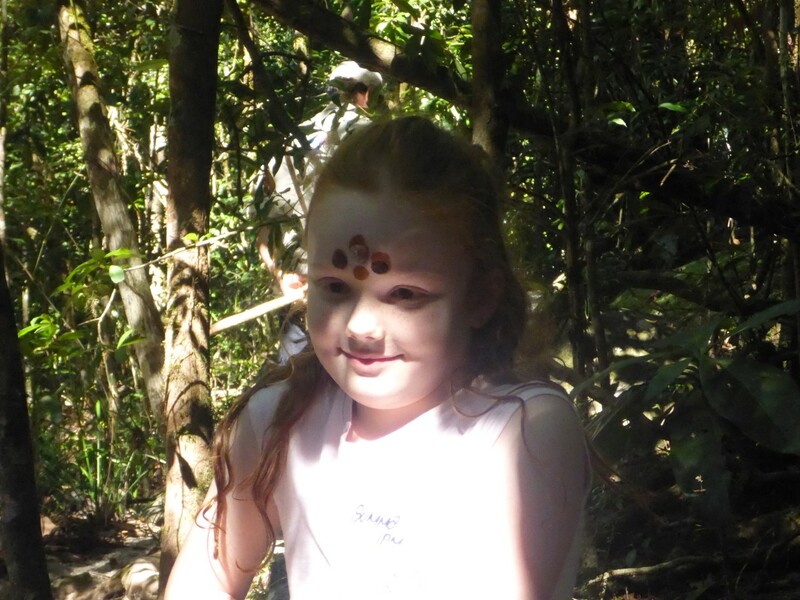 It was a fantastic opportunity for his botanist, Joseph Banks, to collect plants and study local animals. They decided kangaroos were quite tasty! Up at the top of Grassy Hill. They had mostly friendly relations with the local Aboriginals and gained the impression of a well ordered society which lacked in nothing important to life. They discovered they weren’t in the least bit impressed by the usual offerings of beads, cloth and trinkets. Cook voiced the opinion that he rather envied them and wished that European life could be as free of the desire for possessions for their own sake. Dinky little lighthouse, lovely view. The story of Cook town is a typical gold rush tale. The Endeavour River (the only river that Cook actually named) made a natural port and in 1873 a ship arrived and the town was thrown up in the usual tent and shack style. Most of the passengers headed straight to the gold fields, which grew to have around 15,00 miners in it by 1875, 10,000 of whom were Chinese. The town’s population hovered between three and four thousand in its heyday, although by the 1930’s that was down to four hundred or so. The Chinese tended to do best at mining because they would pool their resources and were very thorough. As usual, they set up market gardens and opened stores too. At one time over one thousand per month were arriving from Hong Kong and South China. 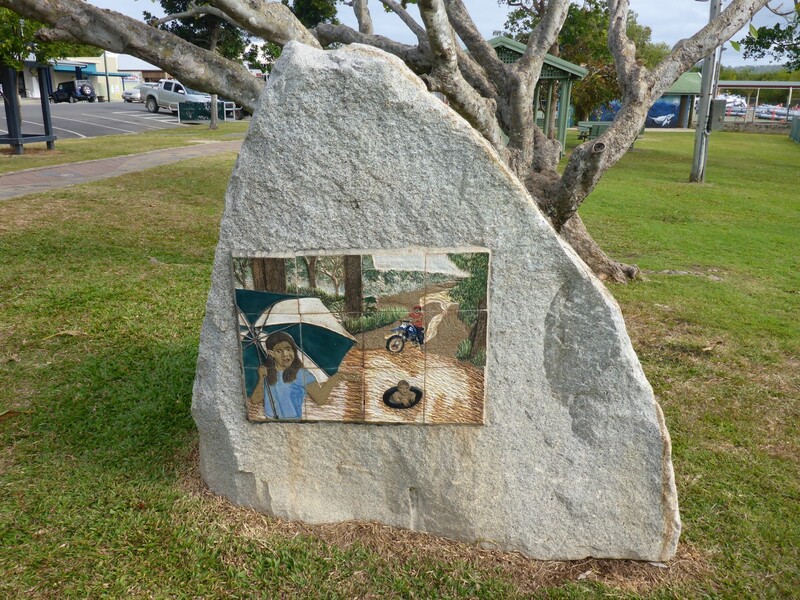 They suffered dreadful racism in Cooktown, as they did in most places, but the families stayed there for several generations. 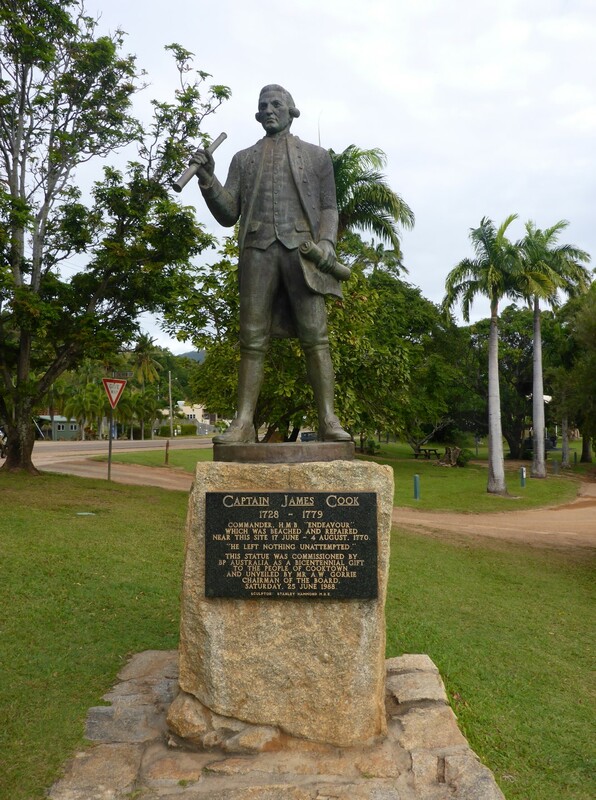 Cook statue, on the foreshore. After the gold had gone mining of other types kept the town ticking over, as did logging and cattle. The roads in the area were very bad initially but were improved gradually during the first half of the twentieth century. But what saved the town from complete decline was tourism. Some foresighted townspeople realised the potential of this growing industry, especially once a bitumen road linked the town to Cairns. Within the town was a former convent school, slowly going to ruin, and the town council acquired it for a nominal sum. They converted it into the James Cook Museum, now run by the National Trust of Queensland and rated as the second best in the state. A coup in terms of boosting tourism was to successfully lobby for the Queen to include Cooktown in her 1970 Australian tour. During her two hour visit she officially opened the museum. The view up the Endeavour River. I found the museum a fascinating place. As well as the Cook story, it has displays on the gold rush, an indigenous gallery, the story of the convent and of the town. It displays one of the Endeavour’s anchors and cannons, thrown overboard to help float the ship off the reef and subsequently found by dive teams. I enjoyed the Endeavour Gallery the most, which covered the fascinating story of wreck and recovery. I particularly liked the large wall boards which had quotes from the diaries of Cook and Banks. Their struggle to release the ship from the reef, sail it up the coast for five days to the Endeavour River, and effect repairs on it, makes for fascinating reading. It shows what a truly great seaman Cook was, as well as his general humanity. Another place I visited was Grassy Hill. 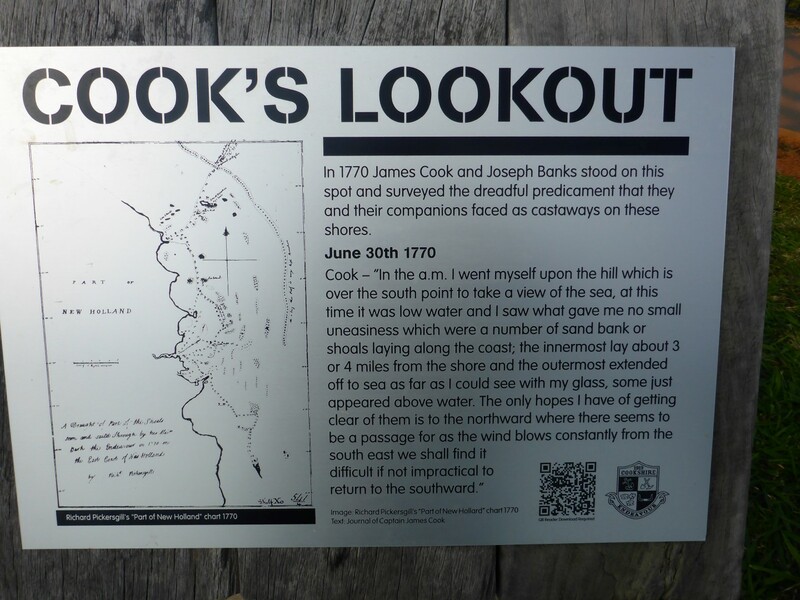 It offers a 360 degree view of the area and Cook came up there often as he tried to work out a route that would escape the sandbars and shallow reefs which blocked his way to the open sea. There is a lighthouse on the hill too, imported from Birmingham in 1885. It’s a peculiar little building, effectively a lamp mounted on top of a corrugated shed. 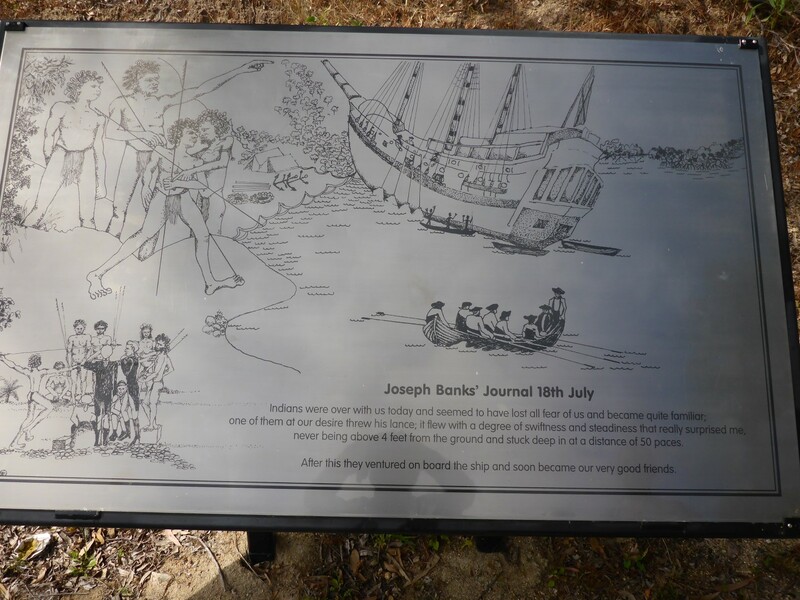 On the road up the hill are various displays telling the Aboriginal story of their dealings with Cook and Banks. Banks’ thoughts on the locals. 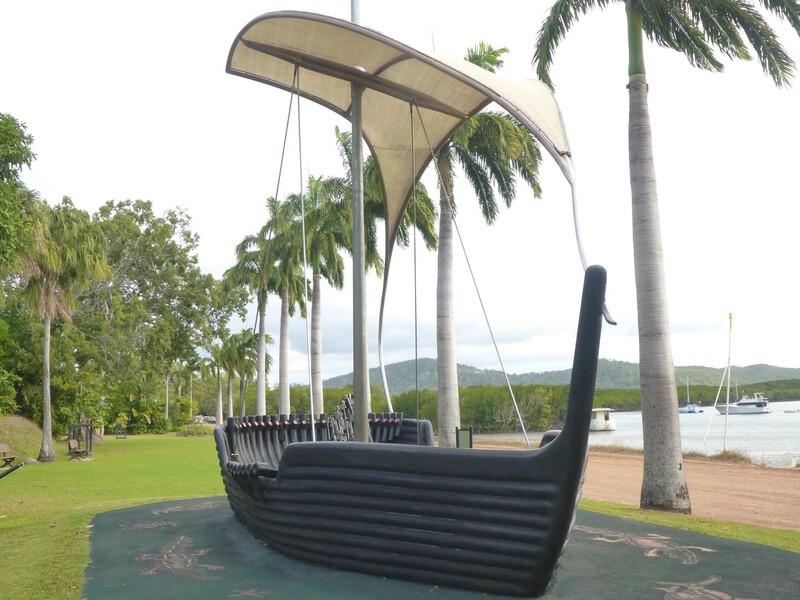 In the Cooktown History Centre are some displays which are purely about the town’s history. The gold rush, Chinese businesses and lifestyle, how the town was nearly destroyed in the 1949 cyclone. Workaday stuff compared to the glamorous Cook, but much more real to the people of the town. I think one of the saddest displays is an honest account of just how badly the indigenous people were treated by European settlers and their governments. Being forced off their land, families torn apart, virtually forced labour on cattle stations etc. A real stain on Australia’s history and there are still many outstanding issues to be tackled. More cheerfully I enjoyed a visit to the Botanic Gardens which have some fine examples of Australia’s more notable trees and plants. Laid ut at the beginning of the 20th C, it fell into run as the town declined but was rejuvenated as the tourism dollar worked its magic. There is a section which includes an example of all the plants that Banks collected in 1770. 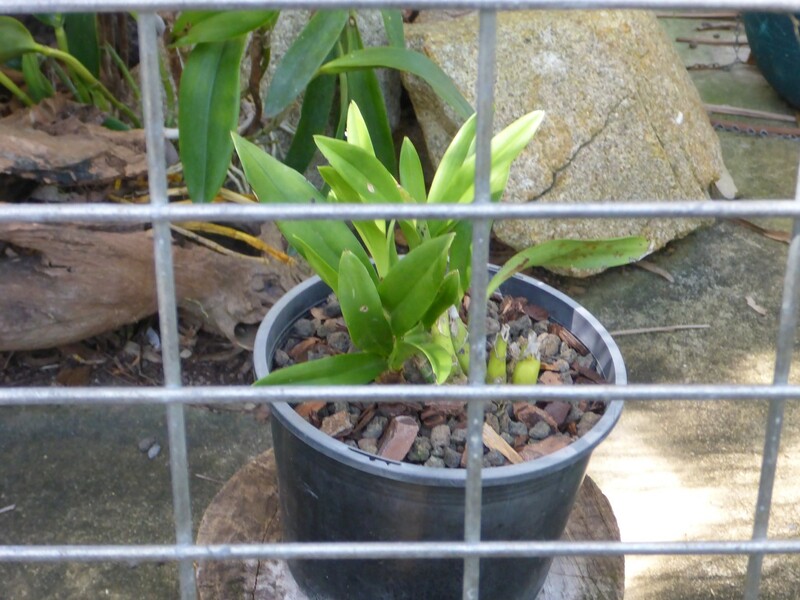 Above all, I was actually able to look at a Cooktown Orchid! 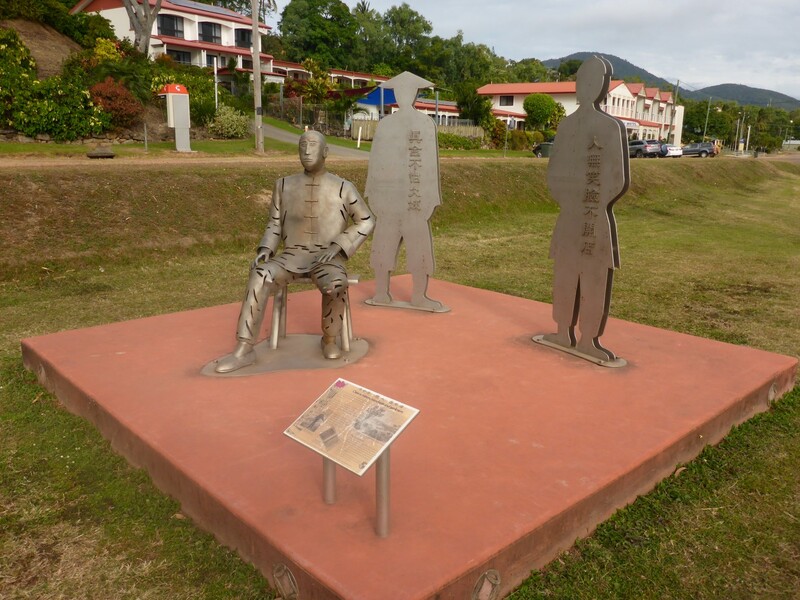 Down on the foreshore there is a living history trail and I admired the statue of James Cook, a cairn that marked the spot where his ship was beached for repairs and a memorial to the many Chinese who came here. In particular I enjoyed the musical ship. This brilliant piece of practical art is a ship made from rubber and plastic and which has on it loads of different percussion type instruments on which kids large and small can pick up the sticks and have a bash. Drums, a xylophone and so on. A great idea and good fun. So that’s Cooktown. Boom, bust and recovery, just like many others. But it does have a special place in Australia’s history and now has a growing population of over two thousand. Three cheers for the Grey Nomad and adventure traveller Dollar. While I was at the campsite I chatted to several travellers who were heading north up to Cape York or, more usefully, were on their way back down. I got loads of information about road conditions and good routes to take. The main road up the Cape is the Peninsular Development Road. It’s unsealed and is used by large trucks. It therefore suffers from a very corrugated surface. ‘Rough as guts’ was one description of it. But I learnt of some very nice alternatives to take so will be looking forward to some nice riding. Since leaving Cairns I’d really begun to feel that a new chapter was opening up in my journey. I’d had a fascinating few days, especially with regard to natural history. I was delighted to have learned something of the indigenous people at last and am looking forward to learning more. It’s becoming clearer how Australia was when it was part of Gondwanaland, demonstrated by the ancient tropical rainforest. I’ve reached a point on the map where the only forward direction from here will take me north to an area with challenging riding and the ‘must ride’ Old Telegraph Line. Goodbye towns and convenient living. Hello to roadhouses, bush camping and deep creek crossings. Come on then, let’s get going! Nice piece of street art. Wetting my appetite to come back to Down Under Geoff. Keep safe now, huh? No more ‘short cuts’!!! What are you waiting for Liz, book a ticket! No more short cuts for me. The straight and bumpy narrow from now on. Great post Geoff. Pleased that your “walkabout” left you relatively unscathed! Next time you go swimming tie your shoes around your neck! Look forward to hearing of your adventures in more detail. Stay safe. Hi Dave. The problem was that I didn’t have any shoes that I was prepared to get wet. I only wish I had. Never mind, it won’t be happening again!